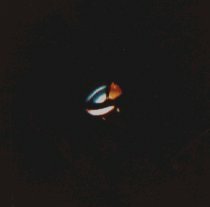 On August 2, 1965, during a large wave of UFOs seen over the Plains States (in the United States), Alan Smith took a series of photos of a UFO he saw. In his report, he claimed that the object was very high. The photo processing company had not printed the UFO photos (most of which showed nothing), but one negative with an object in the corner was found to have not been printed. The photo, cropped, is reproduced at right. The UFO was not in the center of the photo, but was down in the lower right corner (see below). Notice how the photo depicts a circular object that is dissected into several segments and arcs of different colors. The original object was said to have been flashing in several different colors, and UFOlogists have said that this photo shows the method of color change used by UFOs. The object was a lot smaller and a lot closer to the camera. The photo was not taken as claimed. Alan Smith's description of the angular size of the visual object is such that the object would not produce an image of the size obtained without a telephoto lens. Alan had a simple Boy Scout camera. An object the angular size that Alan reported to have seen visually would have left an image on the negative that was too small to be seen without magnification. The image should also have been in the center of the frame. Thus, the negative that was printed was not a negative of one of the shots attempted at the time of the sighting. Note: the page author once shot photos of airplane lights at night, to use as a reference shot for angular size in a photo. A simple camera was used. Magnification was necessary to find the plane lights in the otherwise dark frame. One other thing doesn't make sense. Most people bought black and white film for most photography in 1965, because color film cost about three times the price of black and white. They usually bought one roll of color film for Christmastime photos. It makes sense that a roll might still be in a camera from Christmas, but not a fresh roll of color film in August, unless the family had a lot of money. A lower item suggests that they did not have this money. There are no stars visible in the photo. This may be due to the shortness of the exposure, or because no stars were there. According to other witnesses in Oklahoma that night, there were stars visible in the sky. Flashbulbs were quite unreliable in the 1960s. My main theory is that this photo was the result of a flashbulb failing to go off. Thus, the film recorded only the one direct light source in the field of view. There is a little hole for mounting the filters on each arm, between the filter segments. Notice that it appears in both the UFO photo and in the front view of the Spartus color wheel (photo with red background above), IN THE SAME PLACE ON THE ARM IN EACH PHOTO! Halation (light scattering in the film emulsion) has caused the center of the lamp to appear to spread out beyond the edges of the arms, distorting the shapes of the cutouts. The color filters can be rearranged on the wheel by the user, so they may not be in the same order on somebody else's wheel as they are on the ones in the photos. The color wheel in the photo below the UFO photo (at right, enlarged, and full view) is a different model made by Spartus. I show this file photo I have because the lamp and wheel are at almost the same orientation in it as they are at in the UFO photo. Compare the circles of the lamp housings in both photos.  Notice how the color wheel lamp and the UFO are in almost the same position. The only differences are that the wheel is the wrong model, and that it has made half a turn, so different color filters are in front of the lamp. Note: The color wheel at right is a smaller wheel that takes a 60-watt pear-shaped (A-type) lightbulb. 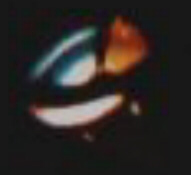 The larger wheel shown above the UFO photo takes a reflector (R-type or PAR-type) bulb, and is the one that is probably in the UFO photo. Notice how the rim of the wheel crosses the opening of the lamp housing, so part of the lamp is seen outside the wheel. Notice that this is visible in BOTH PHOTOS. This explains the white part of the UFO. Notice how a space is visible around the reflector bulb in the photo above the UFO photo. In the UFO photo, the reflector bulb shines on the lamp housing. In the blue sector, this is quite pronounced, with the R-bulb being the inside part, the space between the bulb and the housing being the curved dark line between blue parts, and the illuminated part of the housing being the blue arc. In the red part, the red filter seems to be diffusing the light, blurring the dark line. The two little dots outside the circle on the UFO are probably duplicate motor mounting holes in the lamp housing. Often lamp housings were made to be symmetrical, so it would go on the stand either way (It's cheaper on the assembly line to not have to take time to orient the part before putting it on).  The shape of the brightest part of the UFO is the shape of the face of a reflector bulb. An alternate explanation of the shape of the dark spaces can be found in the shape of the rim and spokes of the Penetray color wheel shown. The dark places are in the correct position. The lamp base is not the one in the UFO photo, but Penetray made many different models. One of the models (which I don't have a photo of) has a base similar to the gold Spartus base, and has a black version of the wheel shown in the Penetray photo. The top picture in the conclusion section at the bottom of the page shows the object in approximately the position it occupied in the original photo frame. This is more evidence that the original photo was a failed attempt to take a picture of a Christmas tree. The lamp is located where it would be if the camera had been aimed at the tree (so the tree would be centered in the frame). Thus, the tree would be the subject of the photo. The color wheel below blown up. The color wheel in the same position. The published photo does not agree with the witness statements about the angular size of the object he saw visually. The upper picture in this section approximates the original frame of the Tulsa photo. The lower picture represents the expected size of the image on the print, based on the witness account of the angular size of what he saw. An expansion to an image that large would require a telephoto lens, which could not be used on the camera Alan had. The object in the published photo is not the subject of the photography. The camera was pointed at something else located above and to the left of the object. The upper picture in this section approximates the location of the object on the original frame of the Tulsa photo. The lower picture represents the expected location the image on the film, based on the witness account of what he saw. The difference is a good 20 to 30 degrees of camera aim - too much to occur by accident. The published photo was probably the result of a flashbulb failing to go off when a Christmas picture was being taken. The use of color film and the nature of the object confirm this conclusion. Alan Smith probably did take photos of an unusual object, but not on the frame containing this object. The negatives of the UFO are probably clear frames with microscopic objects on then (too small to be seen by looking at the negatives). Note: I'd like to see the real frames, if the roll still exists. I am told that it does not. When the UFO photo was not found when the pictures came back, he had only the photo with the round object printed, not all of the other apparently failed shots on the roll. Some of those contained the real UFO. This is a common mistake, because most "real" UFO photos are very small on the negative. This happens, because the object is far away, and thus subtends a small angle. This mistake also happened in the October 21, 1965 St George MN case. In this case, the original object was a light in the night sky. The wrong negative was again chosen to be printed. The object in the photo was a night light. The flash failed, leaving the night light as the only light source visible. 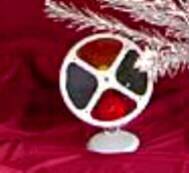 The object in the photo is definitely a color wheel for an aluminum Christmas tree. It is probably one of the Spartus or Penetray models described. I have conclusively demonstrated that.